Enhance the natural beauty of your garden and support a few climbing plants with these Gardman Antique Leaf Trellises. Using trellises in your yard brings unique style to it, while allowing your plants to grow upright and thrive. These 3 metal pieces perfectly enhance the nearby foliage, thanks to their brown tone and leaf shaped accents. Round, metal rods create the rectangular frame of each item, with orbs at the top of each upright for a fun hint. Additional curved rods throughout the unit evoke twigs, and create an open lattice for tendrils to curl around as they grow. Situate these three trellises in a row in your soil to create a screen, or add them behind different plants to support them. Their 10" long legs are simple to insert into your soil, and the brushed bronze highlights on the brown units add a bit of shine. Celebrate nature throughout your yard with these Antique Leaf Trellises. 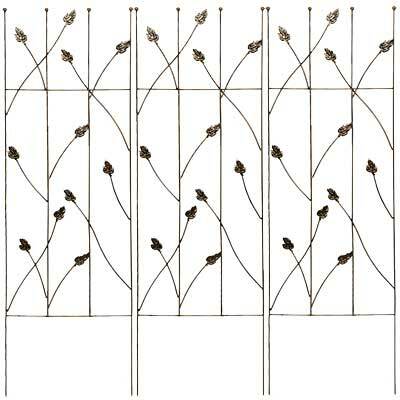 Note: This case pack includes 3 of the Gardman Leaf Trellises, Antique, 60"H.